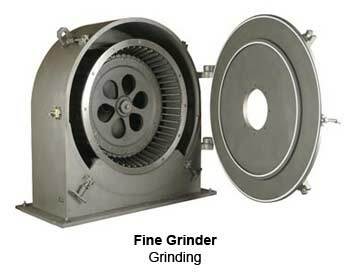 Prater Fine Grinders (M Series Mills) are designed to grind dry, free-flowing material as fine as 200 mesh (75 microns) with very tight distribution of particle size. The highly efficient design allows for ease of access to all internals and is well suited for heat sensitive materials such as resins and sugar. Six sizes are available from the 3 HP M-19 bench scale lab mill to the 250 HP M-101. Designed for a close tolerance between the rotor blades and the grinding jaw/screen frame assembly to produce a more uniform and finer grind. The larger screen to horsepower ratio allows for more capacity. Dual “O” rings seals on the large access door and outboard bearings allow for better dust control. Removing one bolt allows quick removal of the rotor, which is reversible. Rotor blades are easily replaced without further rotor balancing needed. Prater Fine Grinders utilize a high-speed impact principle. The feed material is metered into the center of the mill, where it is impacted by the rotor. The feed material is then thrown outward where it impacts with other particles. aiding in the reduction process. After initial impact, particles are projected across the screen and are sheared between the blades of the rotor and the sizing screen or jaws. This action continues until the particles are properly sized and are discharged through the bottom of the mill. Precision tolerances are maintained between the rotor blades and the stationary grinding surfaces to allow for precise control of finished particle size and distribution. All Prater Fine Grinders come with an automatic door interlock. This device prevents access to mill internals during operation and prevents dangerous motion during access. View/print M Series fine grinder product information document here. M-19 3-5 150 13 in. M-21 10-15 600 27 in. M-36 20-30 900 35.75 in. M-51 40-60 1500 44 in. M-76 75-125 3000 65 in. M-101 125-250 6000 77 in. *Do not use for engineering purposes. Please request a certified drawing for all layout or construction uses.